The Stone Bridge keeper’s house provided a warm refuge from the chill of that day, December 20, 1832, but the man declined Cranston’s invitation to come in, saying he was bound for Fall River. 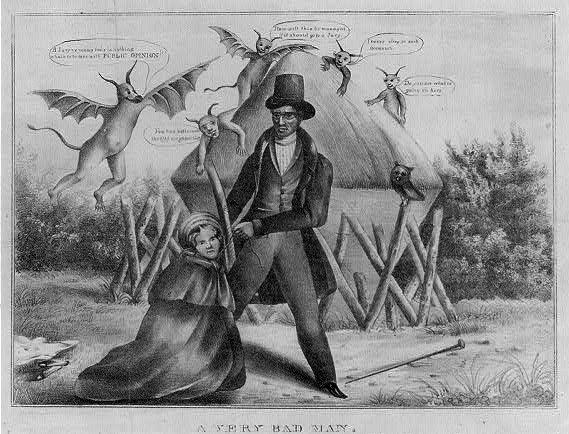 “I shut the gate about sundown,” Cranston later testified, when the man, the Reverend Ephraim Avery, stood trial for the murder of Sarah Maria Cornell, a pregnant Fall River mill worker, whose body was found at sunrise on December 21, hanging from a pole on Job Durfee’s farm. On the morning after the tall man crossed the bridge, Cranston saw tracks “fresh and distinct” in the sand, leading around the toll gate toward the Portsmouth side. It’s not surprising that Tiverton’s Stone Bridge played a key role in the salacious Avery-Cornell murder trial. For more than 150 years, Stone Bridge acted as a funnel through which anyone traveling across the Sakonnet River on foot, horseback, wagon—or later, automobile and street car—had to pass. 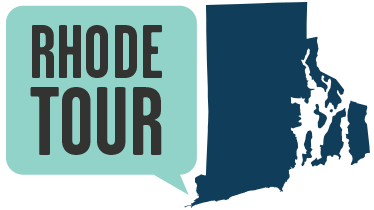 From the 1680s until 1795, when the Rhode Island Bridge Company built a wooden bridge here, a ferry shuttled goods, horses, wagons, and people across the Sakonnet River. The first bridge lasted two years before a high tide swept it away. The rebuilt bridge lasted one year, and ferry service resumed for a decade until subscribers raised $80,000. In 1810, travelers began to cross the new bridge constructed of 280,000 tons of stone at a cost of more than $200,000. The Great Gale of September 1815 bit a 200-foot chunk out of the bridge, and a gale in 1868 caused a similar breach, prompting the state to take control of a new, toll-free bridge in 1871. The free bridge became a popular spot for hooking striped bass, blue fish, and shark, with one reported landing of a 500-pounder. 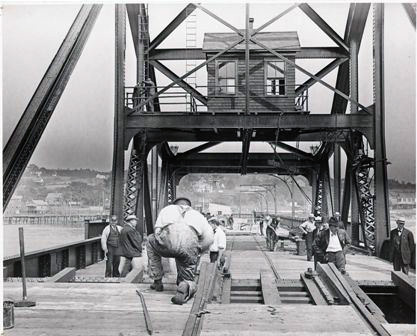 Trolley cars from the Newport and Fall River Street Railways began crossing the bridge in 1898, which required replacing the old wooden draw with iron and steel strong enough to hold 20 tons. 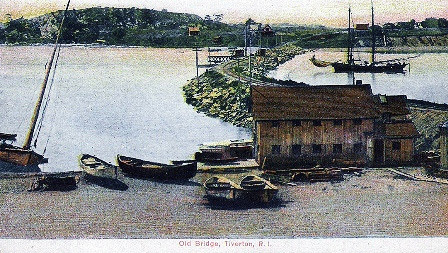 On the Tiverton side of the bridge, a village of stores, fish markets, and blacksmith shops blossomed. For more than 100 years, a succession of inns at the foot of the bridge served weary travelers and hosted milestone celebrations for town residents until the 1980s, when the Stone Bridge Inn was razed. The last car crossed the Stone Bridge on May 6, 1957. The Hurricane of 1938 and Hurricane Carol in `54 weakened the bridge’s approaches and caused service interruptions, leading to construction of the steel Sakonnet River Bridge about a half-mile north of the Stone Bridge. The Sakonnet River Bridge served from 1956 until its replacement was completed in 2012. After almost 150 years of free crossings over the Sakonnet River, tolls may be imposed on the new Sakonnet River Bridge. Finally, despite testimony that the Reverend Ephraim Avery crossed the bridge into Tiverton, met with Sarah Maria Cornell, and crossed the bridge back to Portsmouth on the night of her murder, he was found not guilty. The Stone Bridge Under Construction: This image probably dates from about 1898, when the Stone Bridge was reinforced for the weight of trolleys. The bridge was the key link between Fall River and points north and Newport and points south. After almost 150 years of free crossings over the Sakonnet River, tolls may be imposed on the new Sakonnet River Bridge. Stone Bridge Postcard: This color postcard, taken from the eastern side of the Old Stone Bridge, shows the bridge as it connected Tiverton to Portsmouth across the Sakonnet River. 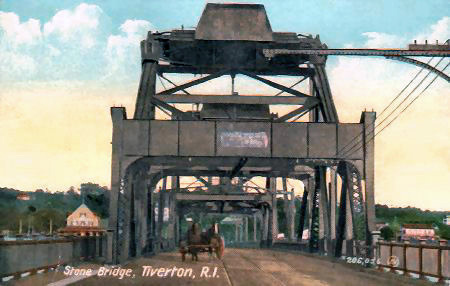 Stone Bridge Drawbridge Mechanisms: The Stone Bridge's drawbridge mechanisms, used to facilitate the passage of water traffic up and down the Sakonnet River, appear in this color postcard. Also evident in this picture are the rails and electric wires of the trolley that once ran along the center of the bridge. A Very Bad Man: The Avery trial was covered widely in the press. This artist's depiction of the murder is based upon testimony from the trial. Avery is shown tying Sarah Cornell to a post in a hay field. Demons surround him, saying, "Do you see what is going on here." "I never sleep on such occasions." "How will this be managed if it should go to a jury." "A Jury ye young fools is nothing. what's to be done with Public Opinion." ~ Source: “A Very Bad Man.” Library of Congress, Washington, D.C. 20540 USA, https://www.loc.gov/item/2008661762/. Accessed 2 Aug. 2018. 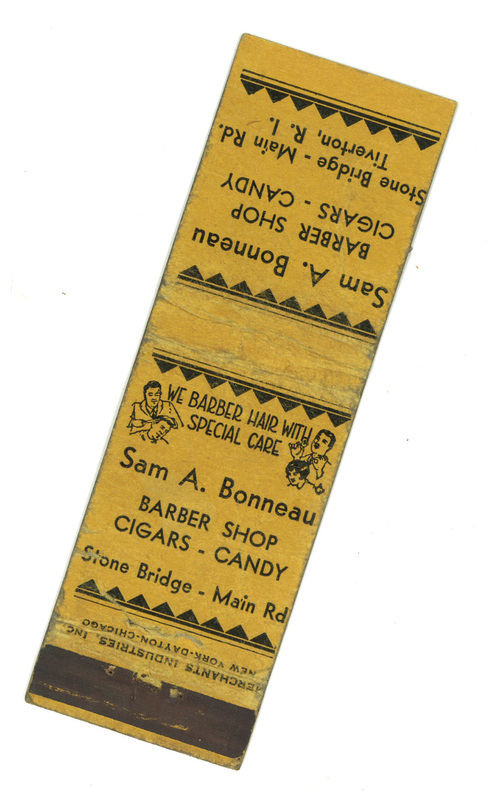 Bonneau Barber Shop Matchbook Cover: The Stone Bridge area became a thriving hub of small businesses offering a variety of products and services including haircuts, candy, and cigars. When the bridge closed, most of these businesses failed or relocated. Gerald Carbone, “The Old Stone Bridge,” Rhode Tour, accessed April 21, 2019, http://rhodetour.org/items/show/95.